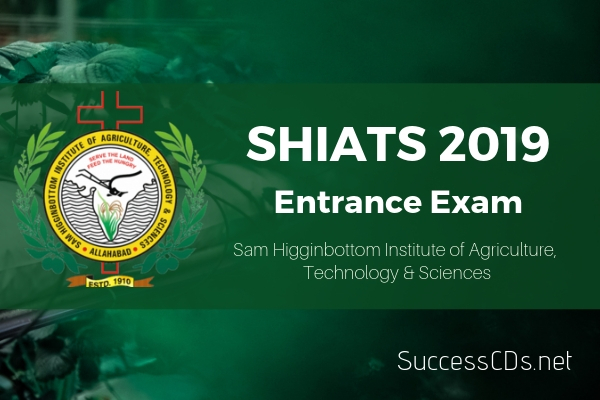 SHIATS Entrance Exam 2019 - Sam Higginbottom Institute of Agriculture, Technology & Sciences (SHIATS) Allahabad invites applications for admission to their following Undergraduate and Postgraduate Programs for the academic year 2019-21. Candidates can read the complete information regarding SHIATS Entrance Exam 2019 such as application form, eligibility criteria, fee details, selection process etc. on this page. Sam Higginbottom University of Agriculture, Technology & Sciences is a Christian Minority Educational Institute within the meaning of Article 30 (1) of the Constitution of India. The University seeks to be centre of professional excellence in education and services by the participation of the students and members from all over India. SHAUTS provides a common Application Form for Admissions to all academic courses irrespective of Undergraduate, Postgraduate, B.Ed., B.P.Ed., M.Ed. and Diploma for admission through Entrance Test and Direct Interview. B.Tech., B.Sc., B.Sc. MLT, BBA, BCA, BA, B.Pharma, B.Com., B.D., B.Ed., B.P.Ed., GNM, M.Tech., M.Sc. M.Sc. MLT., MBA, MCA, M.A., M.Com., MPH., M.Ed., M.Phil., M.Pharma., PhD., Agriculture, Engineering, Science, Bio-Tech., Remote Sensing, Dairy Tech., Food Tech., Animal Husbandry, Management, Education, Film & Mass Communication, Theology, Health Science. 10+2 passed with at least 45% marks for general candidates and 40% marks for SC/ST/ differently abled candidates as per their qualifying examination are eligible for admission to undergraduate programs (check the eligibility criteria from Table No. 8 also) as mentioned in Table No. 4. Candidates appearing in 10+2 examination in 2019 are also eligible to apply provisionally for admission and appear in the entrance test, but they will have to submit documentary proof of successfully completing the exam at the time of counselling. Non-submission of documentary evidence of completion of the examination and attaining eligibility by the time of counselling will disqualify him/ her for admission. Candidates having obtained their bachelor's degree in the final examination in the concerned field under 10+2+4 or 10+2+3 as per their qualifying examination are eligible for admission to PG Programs as mentioned in Table No. 6. Candidates appearing in bachelor's degree exams 2019 are also eligible to apply provisionally for admission and appear in the entrance test, but they will have to submit documentary proof of successfully completing the exam at the time of counselling. Note: Minimum eligibility for admission in PG Programs, please refer Table No. 8 of the concerned faculty. For SC/ST/differently abled candidates, there is a relaxation of 5% in the minimum eligibility. Candidates with at least 50% marks in the bachelor's/ master's degree with at least two school subjects at the graduation level are eligible for admission. Every candidate will have to teach twenty (20) lessons each in two subjects selecting one subject each from the groups given in Table No. 3. B.Ed. with at least 55% marks. The eligibility for B.Ed., B.P.Ed., and M.Ed Program shall be as per the latest NCTE Norms. Regular master’s degree in relevant subject with at least 55% marks (or 6.00 CGPA/OGPA) for general candidate and 50% marks (or 5.5 CGPA/OGPA) for SC/ST/Physically handicapped candidates. Note: For PhD Programs online application form will be available in June 2019 (I Session) and December 2019 (II Session). Entrance Test for Ph.D. programs will be held in July 2019 and January 2020. Note: Candidates of the above mentioned subject group codes are required to attempt the compulsory section (i) and any One from the optional section (ii) from Undergraduate Test booklet UG-2 as per their subject group code filled in the application form. B.Ed. Section - Additional Section for B. Ed. M.Ed. Section - Additional Section for M.Ed. A common Application Form shall be applicable for all academic Programs irrespective of Undergraduate, Postgraduate, B.Ed. B.P.Ed, M. Ed and Diploma for admission through Entrance Test or Direct Interview (excluding PhD, for PhD refer 6.1 on Page No. 112). Prospectus & Application Form can be obtained by sending a crossed bank draft for Rs.450/-(i.e. Rs.400/- for Prospectus & Application Forms and Rs.50/- for postal charges) or $30.00 in favour of the Registrar, Sam Higginbottom. Institute of Agriculture, Technology & Sciences, Allahabad by registered post. Prospectus & Application Forms will be available on cash payment of Rs.400/- (i.e. Rs.400/- for Prospectus & Application Forms) from the University Fee Counter on any working day i.e. from Monday to Friday (09:00 a.m. to 05:00 p.m.). Application Forms A & B duly completed in all respect and accompanied with an Account Payee Bank Draft of prescribed Entrance Test/ Direct Interview Fee on Table No. 1 in favour of SHIATS, payable at Allahabad or a University cash receipt of the aforesaid amount must reach The Registrar, SHIATS, Post. Agricultural Institute, Allahabad on or before May 15, 2019. Candidates can also choose to apply through online application form available on the University Website www.shuats.edu.in. Once form is filled online, upload photo in jpg format max 50kb and make the payment of Rs.1200/- for UG & PG Programs and Rs.1400/- for B.Ed./M.Ed. Program through online (debit/credit card, Net-banking etc). Thereafter printout of Online Application Form with payment details must reach the Registrar’s office positively by 20th May 2019. Kindly take out a hard copy printout of the same and send it to the Registrar’s office positively by May 20, 2019. The admit card will be available on the website of SHUATS only (www.shuats.edu.in) from 15th May 2019 The applicant is required to print the admit card from the university Website at www.shuats.edu.in. However, he/ she is required to bring a passport-size photograph (similar to that pasted on the application form) along with the admit card to the entrance-test center for verification. Separate merit lists will be prepared for each category (Christian & general) based on the total marks obtained by the candidate in the entrance test for the purpose of admission. Separate merit lists under each category (Christian & General) for UG, PG B.Ed. & M.Ed. as per application form number will be displayed on the notice boards of the university by 09th June 2019 and will also be available on the University Website at www.shuats.edu.in the same day. Out of the eligible Programs under the Subject Group Code for UG and Subject Group Number for PG Programs, candidate will be provisionally admitted in only one program strictly on the basis of merit and availability of seat in the respective program.